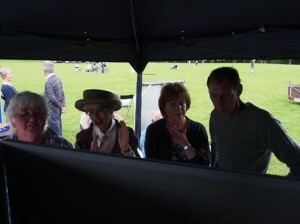 What a lovely busy atmosphere with the busy weavers last Friday afternoon at our Behind the Scenes event. 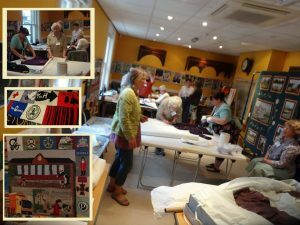 The museum’s talented Textiles Group proudly showed off all their hard work restoring the Congleton Town Tapestry. Well done all of you! Exciting news! 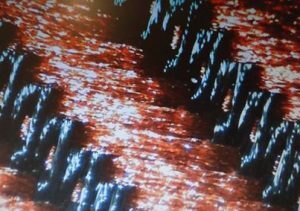 Keith Heron has very kindly donated a microscope for us to use for our MAKING FABRIC FURRY event…and then for many other things after that! 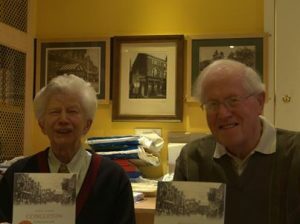 Dr Joan Alcock, pictured with her brother, reminisces with guests at the ceremonial launch of ‘Congleton Through Time’ on 15th May. Joan was accompanied by Collections Manager Ian Doughty, who helped compile the book. Fun times were had and memories shared by all during the successful evening. ‘Congleton Through Time’ is available at the museum shop for £14.99.